90 sqm newly renovated apartment next to St.Stephen cathedral, right in the heart of Budapest, many restaurants and cafes on the doorstep, 5 min.walk to Parliament, 2 min. walk to all 3 metro links is available for rent for short or long term. The information contained in this Web site is for general guidance on matters of interest only. The application and impact of laws can vary widely based on the specific facts involved. Given the changing nature of laws, rules and regulations, and the inherent hazards of electronic communication, there may be delays, omissions or inaccuracies in information contained in this site.Before making any decision or taking any action, you should consult a Framtid Bt. professional. Framtid Bt. is not responsible for any errors or omissions, or for the results obtained from the use of this information. All information in this site is provided "as is", with no guarantee of completeness, accuracy, timeliness or of the results obtained from the use of this information, and without warranty of any kind, express or implied, including, but not limited to warranties of performance, merchantability and fitness for a particular purpose. In no event will Framtid Bt., its related partnerships or corporations, or the partners, agents or employees thereof be liable to you or anyone else for any decision made or action taken in reliance on the information in this site or for any consequential, special or similar damages, even if advised of the possibility of such damages. Framtid Bt. has not verified the contents of such third party sites and does not endorse, warrant, promote or recommend any services or products, that may be provided or accessed through them or any person or body which may provide them. Framtid Bt. has not issued or caused to be issued any advertisements which may appear on these Web sites. Primarily we are doing Swedish, Norvegian guiding, however we can do upon request guiding even in other languages to our tourists. The establishment of our company is closely related to our unforgottable time spent in Sweden. 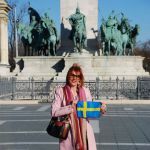 There is a big distance between Sweden and Hungary, which distance you cannot measure only in miles, but even in language, cultural differences. Despite this fact , it is amazing how the two countries’ history has been tied together for more than 1000 years, and nowadays is even closer than ever. We established our company with the goal to create a bridge and be a liason of spreading information, friendships, contacts between these two countries that represent so much for us. The memories I acquired during our stay in Sweden take a big part of my heart and even today they make my heart lift when I recall them. That is the reason why our company’s name is FRAMTID (future in Swedish). We thought that the name, like an imaginary bridge, will connect my Past, Present and Future memories at the same time. Through this company people will discover how two countries have a lot of things in common. I am looking forward to seeing you in Hungary, and I guarantee that whenever season you come, you will get an unforgettable experience, after which you will surely return home with memories of great food, drinks and loving people.